Storefront crashes occur when a car, truck, or van drives through the exterior window or wall of a store. They create an extremely dangerous situation for patrons and employees who are inside the building, as they typically have no warning that an accident is about to happen. Whether you are shopping for groceries or clothes, the last thing on your mind is that a car, truck, or van may come crashing through the store. Those who are shopping comfortably inside are completely unaware of the danger until it is too late. With its scenic ocean views, active nightlife, and plethora of waterfront and outdoor activities, Fort Lauderdale is a popular destination, attracting families, retirees, and tourists to its warm weather and sunny skies. It has an active business community, as well as many restaurants and bars, outdoor cafes, boutique stores, and retail establishments. With over 175,000 residents living in the greater Fort Lauderdale area, the city is racially diverse with 48.4% of its population being white, 31.3% African American, and 16.9% Hispanic. Property values vary widely throughout the city, with those buildings located close to the shore or within exclusive neighborhoods holding significant value, as opposed to those located in lower-income areas. As such, the median property values throughout the city are $273,400 and the median household income is $51,648. With a majority of people using vehicles to travel throughout the city, as well as the large number of retail, restaurant, and commercial establishments, there is a greater chance of storefront accidents happening. The Storefront Safety Council, an advocacy group that tracks storefront accidents since 2012, estimates that one out of every four accidents that occurs in Florida happens in Broward or Miami-Dade counties. Victims of storefront accidents that have been injured may have high medical bills and, in some cases, may not be able to work. Not only are they left with recovering from their injuries, they often wonder how they are going to make ends meet. If you or a loved one has been injured in a storefront accident, the personal injury lawyers at the Wolfson Law Firm can help. They can answer your questions about personal injury claims, discuss options, and work with the insurance companies and legal teams on your behalf. For over 55 years, the personal injury attorneys at the Wolfson Law Firm have defended the rights of victims who have been injured in accidents. If you have questions about a storefront accident, contact the Wolfson Law Firm at (305) 285-1115 for a free consultation. Who is most likely to cause a storefront accident? We often envision storefront accidents as mainly being caused by elderly drivers who confuse pedals or misjudge their speed when they pull into parking spots. Research by the Storefront Safety Council, however, indicates otherwise. Drivers of any age can cause a storefront accident. Drivers between the ages of 20 and 29 are responsible for 20% of the storefront accidents. To expand this further, drivers between the ages of 16 and 39 accounted for 43% of these accidents. Conversely, drivers who were at least 80 years old accounted for 10% of storefront accidents. Based on the research, storefront accidents can be caused by drivers of any age. Distractions, confusion, and impairment are some of the top reasons that storefront accidents occur. Parties who have been injured in a storefront car crash often have medical bills that they need to pay. In some cases, they may be unable to work during their recovery time. If you are wondering how to pay for your medical bills or if you need continuing care, we can answer these questions. If you or a loved one has suffered injuries or a fatality as the result of an accident and would like to speak to our Fort Lauderdale personal injury lawyers, contact the Wolfson Law Firm at (305) 285-1115 for a free consultation. 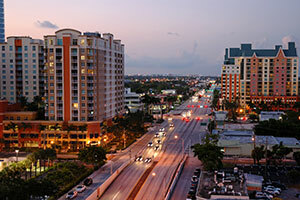 The Wolfson Law Firm proudly serves residents in Fort Lauderdale and other cities in the South Florida region include Key West, Miami, and West Palm Beach. If you or your loved one has been the injured victim from a storefront crash, contact the Fort Lauderdale personal injury lawyers at the Wolfson Law Firm at (305) 285-1115 for help.